This week sports ministers and experts from more than 50 countries are meeting in Berlin to discuss the future of sports under the auspices of UNESCO. Good governance is a key priority. Here Saska Benedicic Tomat, head of projects at the International Sport and Cultural Association, explains why it is so important in grassroots sports. Good governance in sport, particularly at the grassroots where so many people are introduced to sport, is a neglected subject. Local clubs are often run by volunteers, they start small but can grow quickly, and they are faced with challenges both on and off the pitch that the people who run them find hard to deal with. That’s why the International Sport and Cultural Association (ISCA), a global organisation working on grassroots sports, and Transparency International Germany joined forces to develop basic guidelines on the principal of good governance for all types of sports organisations. 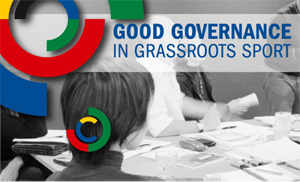 The Good Governance in Grassroots Sport Project (GGGS project), co-funded by the European Commission Directorate General for Education and Culture, has now published these guidelines. Guidelines for Good Governance in Grassroots Sport can help members of boards and committees, executive officers and managers of sport organisations to develop, implement and maintain a system of governance that provides the basic information to establish and maintain an ethical culture through a committed approach. As Mogens Kirkeby, the president of ISCA, points out, this is not just a sport issue, but a societal one. There is a need for good governance principles and guidelines that fit, guide and motivate both the volunteer and employed leaders in this sector. The financial crisis started as a result of very bad governance – the recovery of economic and societal development needs to be based on good governance. This is one of the reasons why good governance will rank very high on the agenda of leaders in grassroots sport in the coming years. However, we cannot just introduce a given set of rules and regulations and then consider they will ensure good governance. Good governance depends on our context, competences and capacity – it depends on our and our colleagues’ leadership skills. ‘One size fits all’ will not work. Hence, sharing and exchanging knowledge about existing governance practices in grassroots sport is essential. The GGGS Self-assessment tool, which is part of the guidelines, is a good example of this because it provides an easy checklist for organisations to see what they already implement and what they might be missing. Now we need to spread the message to raise awareness, improve understanding and create momentum towards positive change in governance in grassroots sports. We strongly believe grassroots sport organisations’ leaders have to preserve the integrity and independence of their sector and they can only do that if they have the right skills and tools. They need to understand and evaluate the role they play and how they can contribute to the organisation. That’s why it is important to show top political leaders that those running grassroots sports are getting the training to ensure they can do their jobs properly. The added value from the European Union, which sponsored the project, in this respect is very high since it can offer room to look at how various organisations, cities and countries have approached governance as well as opportunities for organisations and leaders to benchmark their processes and evaluate where they can make improvements. That’s why we put the handbook together.